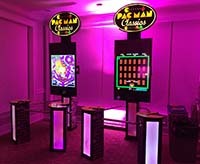 This fun and interactive pop of entertainment will add life to your next corporate event, convention, or seminar by including a classic arcade game or game show experience to your party. Complete with trivia competitions and mental challenges, these games are guaranteed to bring out the creative and competitive spirit in your guests. Give them an experience that will energize the event and keep them happy and productive all year long. Guaranteed to put fun into your next corporate or team-building event, these arcade and table games are one of the most exciting additions you can find. From pinballs to pool tables, Rock Band to Pac-Man, your next corporate or social event will be a memorable one. Our game shows are interactive fun at its best. 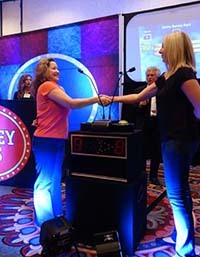 Whether your event involves a group of 75 or 475, this offering brings the best in game show entertainment to your party. This production includes digital scoring, lighting, sound effects and, of course, a charismatic game show host. Trivia categories include entertainment, music, movies, sports and TV shows. Game shows can easily be customized to fit your needs and is perfect for decade parties, team building and company competitions. Our "Name That Tune" is a fun, interactive game that will get your party started and keep the energy flowing till the very end. Guests name the tune, earning points, and then compete with dancing, lip syncing and other activities to do their best against other teams. This entertainment offering is perfect for your private party or as a unique team-building corporate event.